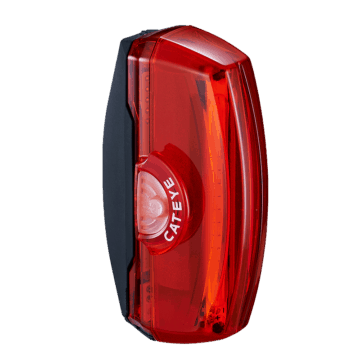 Are you on the lookout for a set of bike tail lights for your riding – day and night? Well, it’s normal to have those questions. In fact, you should be asking these questions. So, here’s the list of best tail lights available in the market today. Among them, you’ll find one that suits you – a compact, smart, good looking, bright or value for money. If you’re looking for a bike tail light that is super bright and doesn’t blow a huge hole in your pocket, then this you should consider the Cygolite Hotshot 100. At 100 lumens, this tail light stands shoulder to shoulder with most of the premium tail lights like the Knog Blinder Road R70 or the Cateye Rapid X3. By now you might be wondering what makes this light the budget option then? I reckon it’s probably due to its design. It’s neither stylish nor sleek, but it definitely works and does its job well. You can mount it on both the seatposts and seat stays with the 2 different mounts provided. The mounting system gives you the flexibility to tilt the light to your preferred angle, but it’s definitely not pretty. It comes 6 different modes, which you easily adjust using a 2 button operation. The battery run time ranges between 2:30 hours and up to a whopping 270 hours running at minimum brightness. One thing that makes the CatEye Rapid X3 stand out is its Lumens to Size ratio. The small, yet stylishly designed Rapid X3 delivers 100 Lumens at its maximum brightness. This is more than enough for you to be seen both during the day and night. It’s solidly built as you would expect from any Japanese brands and especially from Cateye who has been in the business for more than 50 years. Another thing I like about this light is you can mount it on both the seatpost and seat stays. It comes with rubber straps of various sizes to cater for this. My only gripe with this model is that the rechargable USB port is covered by only a thin piece of rubber and prone to getting wet if you’re caught in a heavy downpour. I’ve had one sent in for warranty replacement due to this. 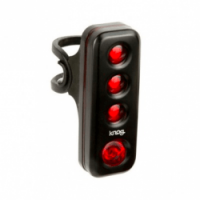 If you are in the market for a tail light that is brilliantly bright coupled with a sleek design, then look no further than the Knog Blinder Road R70. 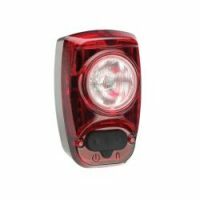 With a total output of 70 Lumens, the Knog Blinder R70 makes you highly visible and will definitely grab the attention of drivers behind you. The Blinder R70 also brought a lot to the table by giving you the option to choose between 5 different light modes and runtime. My preferred mode is the Eco Flash as they last much longer at 20 hours and has a flash beam that attracts attention. The LED’s are carefully placed at an angle don’t blind the drivers, but grab their attention instead. Besides, I also like the fact that it’s 100% waterproof, dustproof and securely sealed. The Exposure Lights TraceR ReAKT has plenty of brightness and long battery life in a very compact body. Packing a 75 lumens LED into such a compact and lightweight body itself is a major achievement for British based Exposure Lights. It’s the successor of the TraceR with big difference being the ReAKT (Ambient Kinetic Technology). In layman terms, the ReAKT is a combination of an accelerometer and ambient light sensor that are built into its electronics. As you ride along roads with changing light conditions, the brightness will adapt accordingly to ensure you’re continuously visible. And as you brake and slow down, the blinking lights will change to a steady light, just like a car brake light. Mounting these requires absolutely no tools at all using the silicon rubber straps and plastic mount provided in the box. However, you’ll need to purchase a separate mounting for aero seatposts. See.Sense is the only one in the market that manufacturers smart rear bike lights today. There are two models available, the ICON and ICON+. Both are very similar with the ICON having a brightness of 190 lumens while the ICON+, 250 lumens. This is achieved by having 2x 95 lumens CREE LED’s or 2x 125 lumens LED’s, depending on the model. 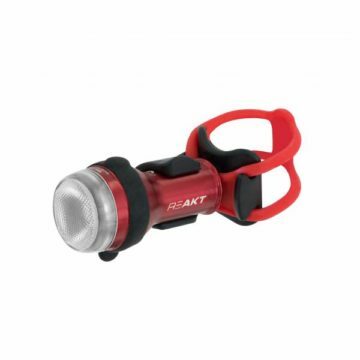 Any rear bike light at 95 lumens is very bright and at 190 lumens, it’s seriously, very bright. And there’s no reason for a driver not to notice you. And better still, the ICON is both connected and intelligent. It has built in sensors (accelerometer and light sensor) and an electronic circuitry that allows the ICON to adapt its brightness and flashing patterns according to the surroundings. As you brake to slow down at junctions and roundabouts, the ICON will adapt accordingly to ensure you’re clearly visible by the cars behind. For those who’re geeky, the ICON pairs to your smartphone where you can manually control the brightness, low battery indicators, set reminder to charge, firmware updates and even inform your loved ones in case you’re involved in a crash, with your exact location. The tail light’s brightness is the most important aspect you should consider before everything else. Generally, the higher the lumens rating, the brighter it is. On the other hand, it would also consume more battery power. PRO TIP : Get a tail light with at least 50 lumens for you to be clearly visible, both day and night. Today, most bike tail lights manufactured by reputable brands usually have a long battery life. You can expect up to 20 hours of battery life if you run them on flashing mode. If you’re on a tight budget, there are still bike tail lights that runs on replaceable alkaline batteries but they’re getting lesser these days. PRO TIP : USB rechargeable Li-Ion are the preferred type of batteries. You’d agree with me that the era of using lights bulbs is coming to an end, and everyone is changing to the use of LEDs. LEDs are much brighter while consuming less power, last almost forever and doesn’t get hot. PRO TIP : Go with LED’s. You might want to consider a tail light that gives you various mounting options. Some of the common mounting locations are the seat post, seat stays, helmet or on the bike rack, if you have one. Things get a little complicated if you have an aero or flat shaped seatpost where you choice of tail lights will be reduced. PRO TIP : Go with a rubber strap mounting as they are stretchable over a range of seat post sizes and shapes. 1. How do I mount the tail light on my road bike? Many people would mount the tail light on the seatpost. Some lights have a separate mounting for aero seatpost since its shape is slightly different. Personally, I’d prefer a mounting system that uses silicone or rubber straps as these fits all types of seatposts and easily replaceable should they break. Alternatively, there are also tail lights that can be mounted on the seat stays if the mounting system supports it. However, be aware that mounting it this way is not ideal as the light is pointing towards the sky at a 45 degrees angle rather than to the driver behind you. 2. 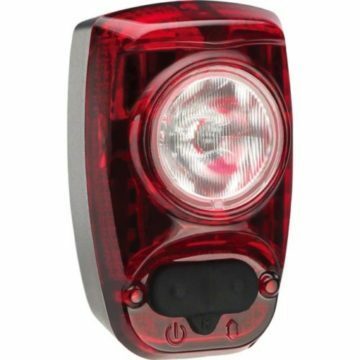 What is the ideal number of lumens for a bike tail light to ensure I'm visible on the road? Ideally, the more the better. But that’s easier said than done. From my experience, anything above 70 lumens is considered very bright. Another thing to consider is the type of light modes available. You’d want it to have blinking patterns that attracts attention rather than a solid red light. 3. Should I use a tail light during the day? In fact, according to ROSPA, 80% of cycling accidents occur during the day especially in urban areas where there are many distractions for the drivers.